The National Archives is the repository of records in various formats. These document the story of our people. A lot has been lost over the years, through disasters both natural and man-made. But fortunately some very valuable records have survived enough to fill the 2 vaults at Government HQ. We have a significant collection of reports, the most complete collection of newspapers published in St. Kitts, and a small but valuable reference library. There is much more that cannot be shelved because we have no space left and have actually filled some of the spaces between the shelf units. There are also a great deal of historical records that cannot even come to us for safekeeping and lie scattered in various locations where we hope they will survive till a better home can be located for them. Today we would like to start a series which will highlight some of the treasures that we hold. We hope that we can make this a weekly event. Please feel free to forward this email to others who might be interested. With Christmas and the New Year celebrations just finished, we thought we should start with an early photograph of the masquerades. This image came to us as a tiny negative. 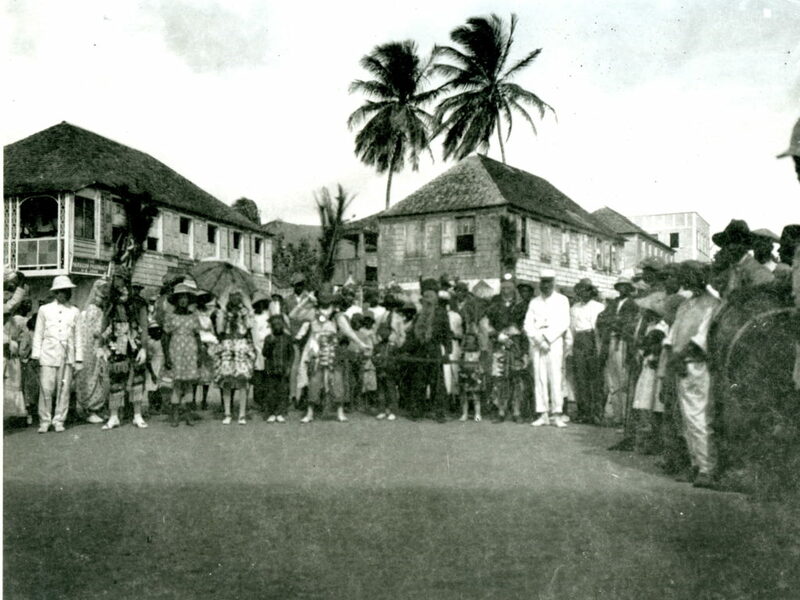 It shows masqueraders gathered at the bottom of Church Street c 1920. In the background is the building that housed the Paragon Pharmacy owned by V E John one of the founders of the Workers League. The site is now occupied by the offices of National Caribbean Insurance.